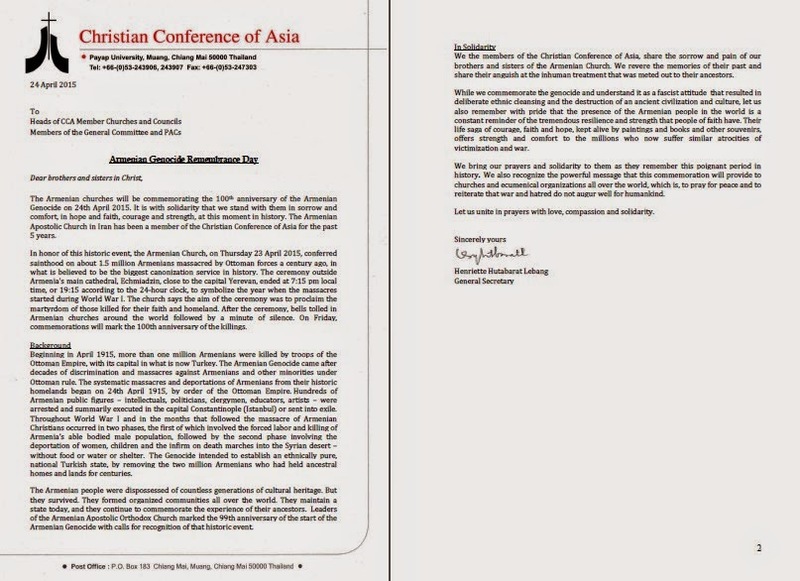 National Council of Churches in India: 100th Anniversary of the Armenian Genocide. Asian Churches in Solidarity. Beginning in April 1915, more than one million Armenians were killed by troops of the Ottoman Empire, with its capital in what is now Turkey. The Armenian Genocide came after decades of discrimination and massacres against Armenians and other minorities under Ottoman rule. The systematic massacres and deportations of Armenians from their historic homelands began on 24th April 1915, by order of the Ottoman Empire. Hundreds of Armenian public figures – intellectuals, politicians, clergymen, educators, artists – were arrested and summarily executed in the capital Constantinople (Istanbul) or sent into exile. Throughout World War I and in the months that followed the massacre of Armenian Christians occurred in two phases, the first of which involved the forced labor and killing of Armenia’s able bodied male population, followed by the second phase involving the deportation of women, children and the infirm on death marches into the Syrian desert – without food or water or shelter. The Genocide intended to establish an ethnically pure, national Turkish state, by removing the two million Armenians who had held ancestral homes and lands for centuries. The Armenian people were dispossessed of countless generations of cultural heritage. But they survived. They formed organized communities all over the world. They maintain a state today, and they continue to commemorate the experience of their ancestors. Leaders of the Armenian Apostolic Orthodox Church marked the 99th anniversary of the start of the Armenian Genocide with calls for recognition of that historic event. We the members of the Christian Conference of Asia, share the sorrow and pain of our brothers and sisters of the Armenian Church. We revere the memories of their past and share their anguish at the inhuman treatment that was meted out to their ancestors. While we commemorate the genocide and understand it as a fascist attitude that resulted in deliberate ethnic cleansing and the destruction of an ancient civilization and culture, let us also remember with pride that the presence of the Armenian people in the world is a constant reminder of the tremendous resilience and strength that people of faith have. Their life saga of courage, faith and hope, kept alive by paintings and books and other souvenirs, offers strength and comfort to the millions who now suffer similar atrocities of victimization and war. We bring our prayers and solidarity to them as they remember this poignant period in history. We also recognize the powerful message that this commemoration will provide to churches and ecumenical organizations all over the world, which is, to pray for peace and to reiterate that war and hatred do not augur well for humankind. Let us unite in prayers with love, compassion and solidarity. Your Holiness and Your Grace Archbishop Sarkissian, Greetings of Peace. At this time of commemorating 100 years of the genocide of 1.5 million Armenians from 1915 to 1916, one of the most inhuman atrocities to occur in the 20th century, we remember you our dear Armenian brothers and sisters in our thoughts and prayers. We the members of the Christian Conference of Asia, share your sorrow and pain at the loss of your cultural heritage and your ancestral homes. We revere your memories of the past and are horrified and shocked at the injustice that was meted out to your ancestors. While we commemorate the genocide and understand it as a fascist attitude, that resulted in deliberate and inhuman ethnic cleansing and the destruction of an ancient civilization and culture, let us also remember with pride that your presence in the world is a constant reminder of the tremendous resilience and strength that people of faith have. The life saga of courage, faith and hope kept alive by paintings and books and other souvenirs, offers strength and comfort to the millions who now suffer similar atrocities of victimization and war. We remember with pain the victims of the Armenian Genocide and pray in memory of the Armenian martyrs. 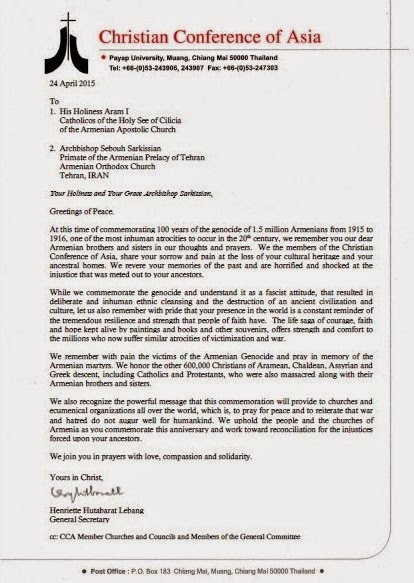 We honor the other 600,000 Christians of Aramean, Chaldean, Assyrian and Greek descent, including Catholics and Protestants, who were also massacred along with their Armenian brothers and sisters. We also recognize the powerful message that this commemoration will provide to churches and ecumenical organizations all over the world, which is, to pray for peace and to reiterate that war and hatred do not augur well for humankind. We uphold the people and the churches of Armenia as you commemorate this anniversary and work toward reconciliation for the injustices forced upon your ancestors. We join you in prayers with love, compassion and solidarity.